Emerged on May 20 (I think) from an elm leaf containing two mines of Agromyza aristata. Christer Hansson: "Pnigalio sp., a female"
There is a single host record for Agromyza aristata in the 1979 Catalog of Hymenoptera in America north of Mexico. It is on page 968 and is for the eulophid Pnigalio maculipes, which also parasitizes lepidopterous leaf miners. From photos of Pnigalio females on this web page, it would appear that your image may be of Pnigalio maculipes. of these parasitoids I'm rearing in case anyone ever wants to look at them. Do you think it makes sense to make provisional guide pages for the above and this one, or just move them to Eulophidae for now? You could put some specimens in alcohol and send them to SEL. They have a chalcid specialist who can provide an ID to genus or species. 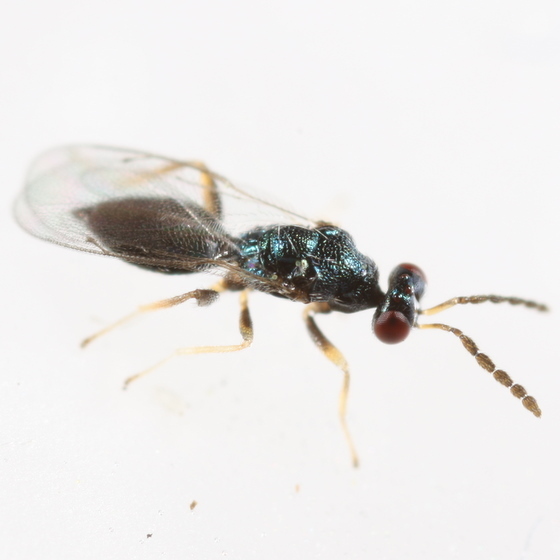 Until the ID is forthcoming or in lieu of someone with chalcid expertise suggesting otherwise, I suppose it would be better to just move the images to Eulophidae for the time being. I will definitely look into sending specimens to SEL. I have a few other chalcid specimens on point mounts--is this a bad way to go? Also, would SEL be the best place to send cynipids for ID? I should have pointed out that SEL's policy for providing IDs of parasitic Hymenoptera is that they must be reared, and your specimens would meet that condition. There is simply no way that they could handle the numbers of specimens of parasitic Hymenoptera that could be submitted if they, for example, accepted submissions of Malaise trap collections. As for making IDs from images, I believe that their policy is that they only accept images from APHIS/PPQ for purposes of quick turnaround on cargo being held pending ID at ports of entry. For those, APHIS needs to follow strict protocols with regard to image submissions in order that that the images will provide clear views of the characters critical for particular groups. The specialist always has the option of requesting the specimen in the event that the image isn't deemed satisfactory. As for point-mounted versus alcohol, their specimen preparation guidelines indicate that both are acceptable for Hymenoptera. Looks like I do need to get some alcohol and vials for microhymenoptera, though, according to the more detailed guidelines.